I've got some YUMMY swatches today! 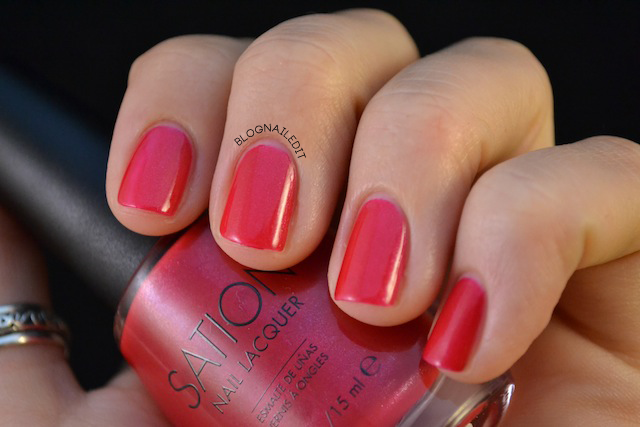 Have you ever heard of Sation polish? It's the signature brand of Miss Professional Nail. They recently re-branded and completely modernized the brand, making it more modern with a custom-made bottle and brush. Both of these revamped features were wonderful to work with. The shape of the bottle fits well in a Helmer. Comparable in height to China Glaze bottles (slightly bigger) but less wide, it's a pretty perfect shape. The bottle isn't a perfect circle, which lends itself well to stuck caps that need a strong grip to untwist. The brush's bristles were all very even on the bottles I was sent, and the shape was great. I had no problems with application that came from the brush. All the polishes I'm going to show you are formaldehyde, DBP & toluene-free, available at Miss Professional Nail for $5. This is Love at First Lavender. Yep, we started with a bang. A bang of a ridiculously bright, ridiculous addicting lavender shade. What you're seeing is color-accurate. It really does come across that bright on your nail, and it really is that stunning. 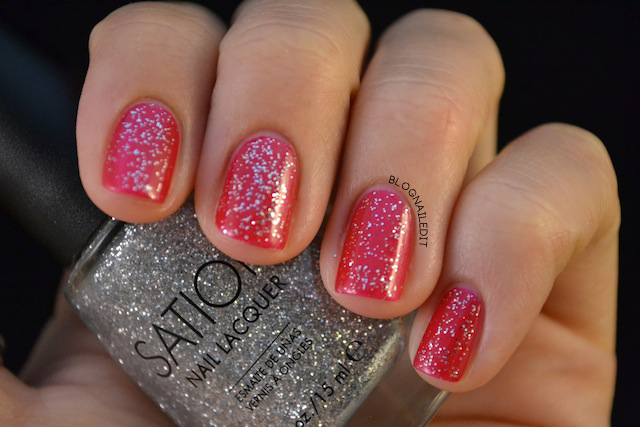 I loved the formula for this one, and it took two very effortless coats to reach 100% opacity. Next is Fan the Flames Fuchsia. 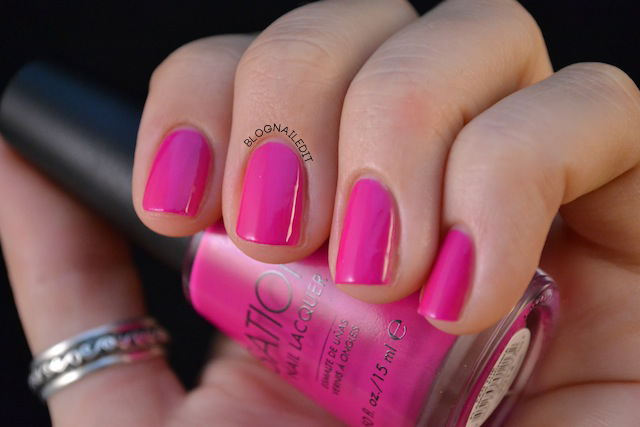 Another eye-catching shade, Fan the Flames Fuchsia applied flawlessly as well in two coats. These were my two favorites in the bunch because I'm a huge sucker for creme polishes. I bet if you saw this on a stranger's nails, you'd either stop to ask them what it was and where to get it, or you'd do the secret "I hate that girl" thing all girls inevitably do to girls they're feeling a little jealousy towards. The last polish from California Gleamin' doesn't fall in the same realm as the previous two, so I'm curious to see what the rest of the line holds that would tie this in. This is Seriously Slate. Not a creme like the other two, and much less easy to work with. It's one of those streaky polishes that takes three careful coats to reach the level of opacity and become even on the nail. Once it's there though, it's pretty great. You can see the little pieces of shimmer in the gun-metal grey. Those make it special and help save it from the poor formula. The next two polishes can both be purchased from Miss right now. First up, Strawberries. This one pleases me greatly. It's so bright, and has more hints of orange than some other reds, which I prefer. It's perfectly named too. The color reminds me of the leftover strawberry juice that winds up all over your hands when you're cutting up strawberries. Like Seriously Slate, there are little flecks of shimmer, which you can see a bit better below. It didn't apply as opaquely as Fan the Flames Fuchsia or Love at First Lavender, but in two coats it was perfect. 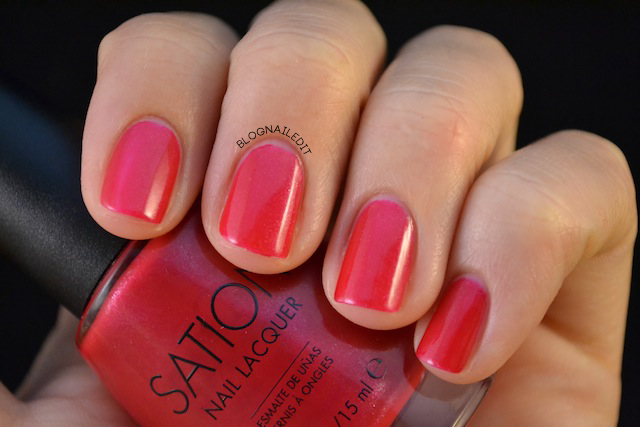 I think this may be considered a jelly, but I'm still a bit confused about the lingo behind different polish formulas. This is a great color and formula though, and I'm please it's part of my collection now. My ever-growing, ever over-flowing collection. 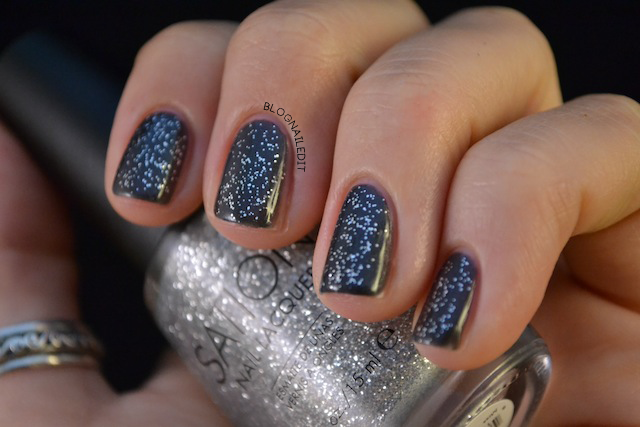 The last solo polish I'll show you today is Electrical Storm, a tricky girl. I say Electrical Storm was tricky because it's a very thin, pearly iridescent that's a damn chameleon. (That's a good thing.) It needs lots of coats (4-5) to reach a good level, but even then it's certainly not opaque. That's okay though. You shouldn't buy an iridescent like this expecting it to be an opaque polish. It's meant to give your nail more life, and I like it best worn the way I have here. You can still see my nail line underneath, but the pearl color distracts enough from that, also magically elongating my nails somehow. Maybe that's just white shades that do that for me. The chameleon polish changes in whichever light it's in, sometimes going a little green, sometimes a little blue, but predominantly purple, as you can see in my shot. Careful with this one, it takes a while to dry, even with a quick-dry topcoat. Were you counting? If so, you'll notice there's an extra bottle in the top picture I haven't gotten to yet. (Or you just saw the glitter and asked yourself "WHERE IS THAT ONE?!") Hold tight, because this one's a crowd pleaser. Silver Glitter is the last in the bunch of polishes I was sent, and I thought it best to show it to you over the other 5 colors you've already seen. Each of these swatches is one layer on top of the other colors. So good right? Overall I'm thrilled with these polishes. I love that they're cheap, you can get them online, and their formulas are mostly easy to work with. I can't wait until they release the full lineup for California Gleamin'. If the colors are as eye-poppingly lovely as Love at First Lavender and Fan the Flames Fuchsia, they'll be big hits in my book. fall in love with electrical storm!! LOL Im so silly. 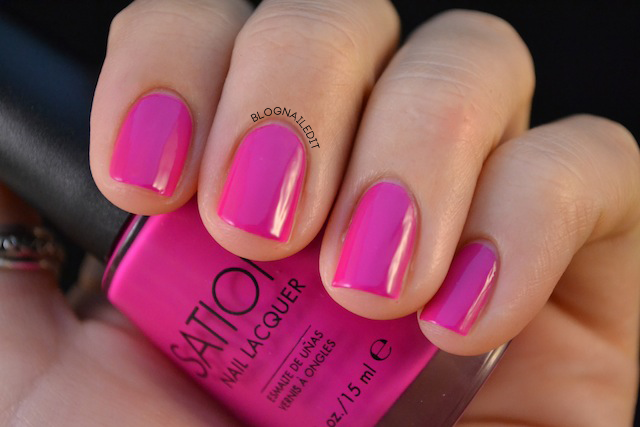 I read your watermark "BlOG NAIL EDIT". In my head Im like, that doesnt make sense?!??! Oh wait "BLOG NAILED IT" HAHAHA. Hope you got a laugh out of that! Great swatches! 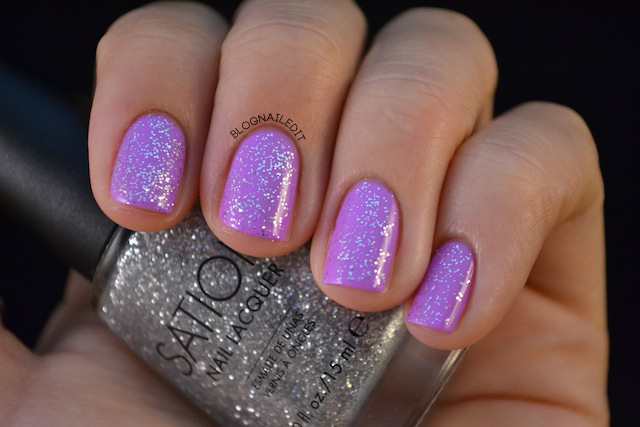 I love the glitter over the other polishes! They sent me some to review too! I enjoyed mine as well, but found the brush to be kind of a pain. It was just a bit too wide. And I like wide brushes normally! All the colors are lovely, but the lavender is my favorite! Wow! I love these colors... Do you happen to know if the ship to The Netherlands?? I'm not sure. Their website just says "Miss Professional Nail ships to most countries". You should contact them to find out. I've been hooked on Sation polishes for years now. I used to find it at a number of salons locally, but not for the last year. Just tonight, I started the online search and found a number of sites, but yours is great, and to find the link to Miss Professional Nail was terrific. You're right about the colors being true to what you see in the bottle. Spot on every time and the wear time is wonderful as well. Years ago, I stopped a gal in a mall that had the greatest shade of polish on and asked what it was. She said it was Sation Cotton Candy. I went right out and bought it. Now people stop me! 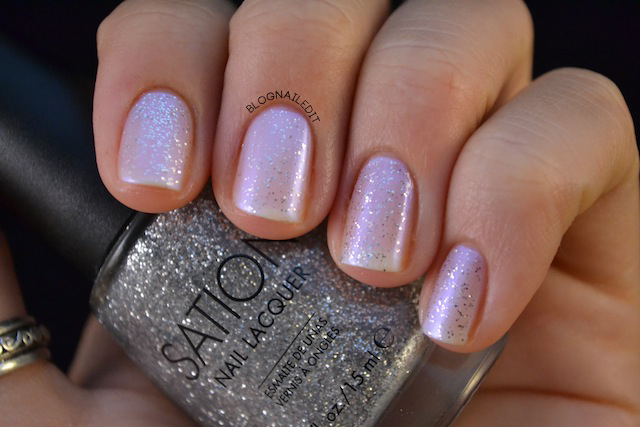 It is an iridescent pale pink but is chameleon like as it adds a lavender sheen as you turn your hand. Love it; so much fun. I am so happy to find your blog and all the great photos and information. I've got you bookmarked and will be back regularly. Tomorrow, hehe, I'll be over at the Miss Professional Nail site, woohoo! Stay tuned then JennyD! 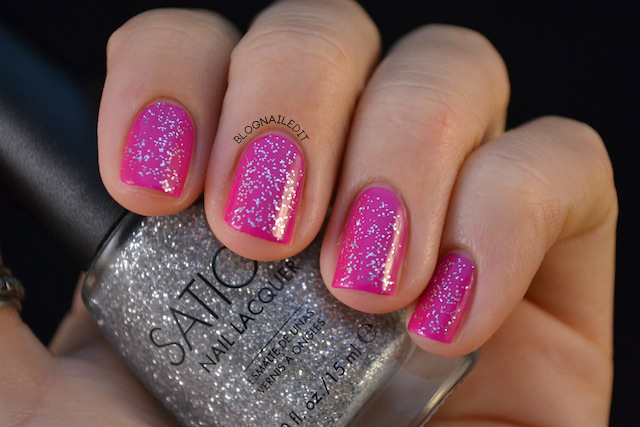 There will be some more reviews of a new line coming out shortly here at Nailed It! not all Sation products are toxic chemical free as you can see here. I don't know if part of the re-branding mentioned at the beginning of this post was a move to be 3-free, but the polishes mentioned in that article you linked are no longer available. They were part of Sation's old line and look. So perhaps they were NOT 3-free during the production of those 3 products. It would be more helpful if the authors of the article tested the new line of polishes and products.